On September 3 2009, Madonna’s Sticky And Sweet world tour was named the highest-grossing for a solo artist ever. The tour, which finished in Tel Aviv on September 2 2009, made $408 million (£250m), according to promoters Live Nation. 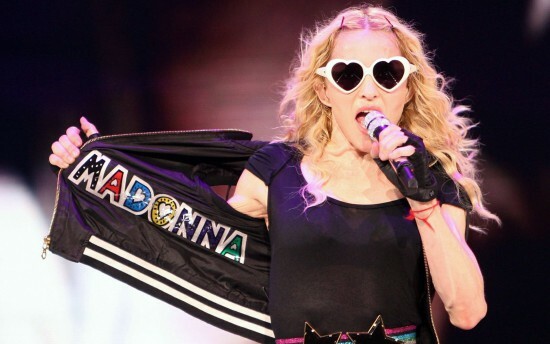 During the tour, Madonna played 85 shows, drawing in more than 3.5 million fans from 32 countries. 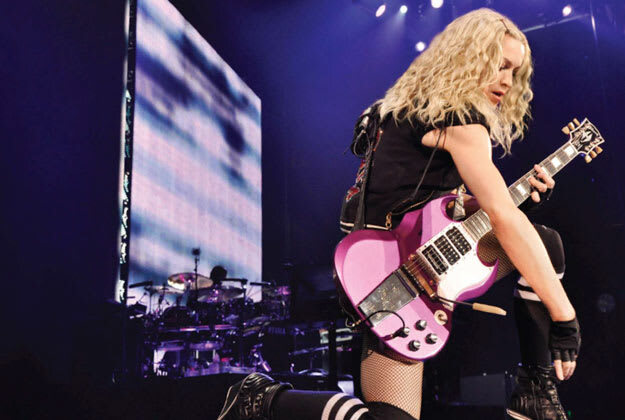 The Sticky And Sweet tour broke Madonna’s previous record for the most successful outing by a solo artist with her 2006 Confessions Tour, which grossed $194 million. On June 5 2008, Madonna added a fourth Sticky & Sweet Tour show at New York’s Madison Square Gardens for October 12. In total, Madonna enjoyed four sell-out shows at Madison Square Garden, generating $11.5 million in ticket sales from just under 62,000 fans. This gave Madonna a record breaking 23 sold-out performances at the venue since 2001, a record for a single artist in that decade. Madonna Fans! Can you believe that both of the Sticky & Sweet shows scheduled in London and Manchester this coming summer sold out a few minutes after they went on sale yesterday?! To extend a tour is a first for Madonna, and it could only happen thanks to your incredible support. We can’t wait to see you on the road and to celebrate another hot Madonna summer with each and every one of you. Let’s get this party started. Again! Which show did you go to? We caught Madonna in Toronto – what a show! On January 19 2017, Madonna participated in a discussion about feminism with Elizabeth Alexander, Marilyn Minter and the director of the Brooklyn Museum (where the discussion was held), Anne Pasternak, in New York City. At the talk Thursday night — which was introduced by Anne Pasternak, the director of the Brooklyn Museum, and moderated by the poet and essayist Elizabeth Alexander — one of the most interesting discussions surrounded the topic of sexuality and aging. Both Madonna and Ms. Minter frequently cited the virtue of resilience, saying it had been central to their successes. For example, Ms. Minter said, it was often the “white heat” and praise that got her into trouble as an artist and made her complacent about pushing forward. Even so, she said that if she had learned one thing from the election, it was that women needed to get better at supporting each other. She noted the robust support for Mr. Trump by white women and the fact that the sharpest criticism she’s faced over the years has been from other women. Unsurprisingly, both Madonna and Ms. Minter were headed south to take part in the Women’s March on Washington. How were they getting there, Ms. Pasternak asked. “I’m taking the bus,” said Madonna. “Me too,” said Ms. Minter. On September 1 2009, the final Sticky & Sweet Tour date took place in Tel Aviv, Israel. Madonna’s triumphant and record shattering Sticky & Sweet Tour will be making its last and final stop September 1st in Tel Aviv, Israel at the Yehoshua Gardens (HaYarkon Park). Tickets will go on sale this Wednesday, June 3rd – complete details below. “I’m very excited about returning to Israel for my last and final show. I know it will be unforgettable” commented Madonna who last performed in Israel in 1993. The Sticky & Sweet Tour – a stunning extravaganza gives fans a breathtaking never before seen or heard once-in-a-lifetime experience. One of the top selling touring acts of all time, Madonna’s Sticky & Sweet tour played 58 cities last summer to wild critical acclaim and before over two and a half million adoring fans including sold out performances in Paris (80,000 tickets sold), Zurich (72,000 tickets sold), London (74,000 ticket sold), Vancouver (50,000 tickets sold), South America (650,000 tickets sold) and three sold out Madison Square Garden Shows in New York City. “In the premiere league of song-and-dance spectaculars, the queen of pop remains unrivalled and undefeated” raved the London Times of Madonna’s show in England. Sticky & Sweet is scheduled to start up again in London’s 02 Arena on July 4th with additional dates in France, Belgium, Italy, Spain, Russia, Sweden and many other countries before finishing on September 1st in Tel Aviv. Madonna joined creative forces with director Jamie King to create Sticky & Sweet which includes a troupe of l7 dancers, a specially built stage, hundreds of costumes and cutting edge visual technology. A multi million platinum selling recording artist, world class entertainer, singer, producer, songwriter, visual revolutionary, children’s book author, film director, documentarian, cultural icon and Rock and Roll Hall of Fame inductee, Madonna’s career continues to inspire her many fans around the world. She continues her unparalleled career which thankfully for her legion of fans shows no signs of slowing down.